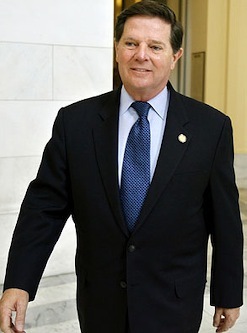 Former House Majority leader Tom DeLay gets a two-time champ while Michael Irvin draws Season 9's only rookie. Which means that Irvin will be up against it while DeLay gets a kick start when the two Texas connections begin hoofing and puffing on ABC's Dancing with the Stars. 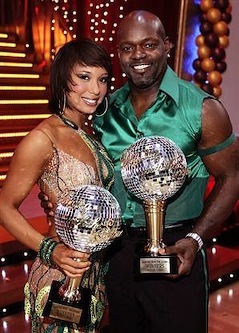 DeLay's pro partner, Cheryl Burke, helped guide and glide Irvin's former Dallas Cowboys teammate, Emmitt Smith, to Season 3's championship. She also mentored Drew Lachey all the way to the Mirror Ball trophy. Irvin's dancemate, Anna Demidova, looks hot, but can she effectively choreograph a fox trot? Ex-pro football stars generally have done very well on Dancing, but the odds against Irvin just went up with a freshman on the floor with him. Mark Cuban's former partner, Kym Johnson, is paired with Donny Osmond. Debi Mazur gets self-important Maksim Chmerkovskiy, who won ABC's recent The Superstars competition in partnership with freestyle skier Kristi Leskinen. Kelly Osbourne teams with Louie Van Amstel, back for a fifth season. Julianne Hough, also a two-time champ with Apolo Anton Ohno and Helio Castroneves, is sitting Season 9 out in favor of touring as a country singer. But her brother, Derek Hough is back for a fifth season, this time with snippy supermodel Joanna Krupa. She's fresh from dissing and cursing Terrell Owens during their quality time together on Superstars. It all starts again on Sept. 21st.